Celebrate regional flavor with this sampler of gourmet salts from across the USA. Add regional zest to any dish with this all-American assortment of 11 gourmet salts. 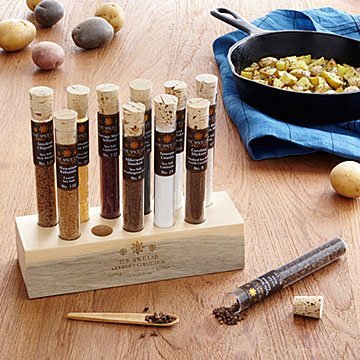 Unlike traditional table salt, this vibrant and comprehensive collection contains seasonings distinguished by the unique terroir from which they're sourced across the United States. The California salt is infused with Sonoma County and Vintage Merlot, recalling the lush vinos harvested from Napa Valley. The New Mexican variety gets its heat from smoked chipotle, and the Maine, North Carolina, and Washington salts have been smoked with American hardwoods for a distinctively earthy and robust character. Other salts in the assortment feature flavors based solely on the resources of a select locale: Hawaiian salt gets its striking black color from lava; Utah "sweet salt" (also called "Utah Red") comes from an underground prehistoric salt deposit deep inside a mountain; the New York salt is harvested from the Finger Lakes region of the state. Stumped about how to get the most out of each one? Consult the included guide to have a blast bringing your go-to dishes to life. The set is displayed in a handcrafted wooden base. Made in the US. Test tubes can be hand washed and reused. Wipe bamboo rack clean with damp cloth. The salts are all naturally harvested and packed in an allergen free facility. My husband loves to cook but has every kitchen gadget imaginable, so it's very hard for me to find something he doesn't already have. These salts were the perfect gift and he loved them. We can't wait to try them all! Great for trying new recipes adding new flavors! Easy to use, easy to choose. Decide which country your taste buds would like to visit! Being that he is a fanatic salt lover, I think in the two weeks he's had it he's tried every flavor. The packaging is beautiful, and I would definitely get it again as a gift! This was a gift for my son in law. He tells me he really liked the collection. He is a gourmet cook at home so that says a lot! perfect for the cook in the family! really nice presentation. perfect for the cook who has everything! Good choice for a cook. Previously I had given my sister-in-law the Salts of the World set and she loved it. She cooks a lot and really appreciates the artisanal salts for cooking and finishing. She says she never uses plain salt anymore. They love these salts and are having fun experimenting with them.